More than 20 central Queensland year 12 students shifted gears and saddled up to explore trade careers in a week-long training event held in Dysart last week. 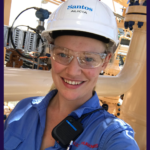 The students, from Moranbah, Glenden, Dysart and Blackwater put themselves in the race for highly sought-after apprenticeships when they were shown the inside running from current BHP Mitsubishi Alliance (BMA) apprentices from the Saraji and Peak Downs mines. The apprentices helped the students construct motorised bicycles from second-hand materials donated by Mackay’s Incredible Tip Shop. “The students received a real insight into life on site, with safety and teamwork the key focus,” said BMA Asset President James Palmer. “Our apprentices loved the opportunity to help students who are considering following in their footsteps, and we hope that the camp has given them the confidence to embark on a trade career,” he said. “We’re particularly pleased to see the high level of interest among young women in joining BMA, which is a great sign as we aim to boost the gender diversity of our trade workforce.” Mr Palmer said. 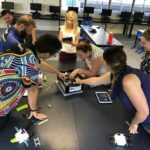 “This camp provides a perfect opportunity for students to learn 21st century skills related to critical thinking and collaboration and team work, all of which are now demanded by our sector,” said Katrina Lee Jones Queensland Resources Council (QRC) Director Skills, Education and Diversity. Each team of students presented their project for inspection by BMA staff, with one recognised for building the best bike. The event was run by the Queensland Minerals and Energy Academy.